So-Saree completed 6 years of existence on the 16th of this month. We celebrated it with a beach vacation. Last year was quite laid back, but I really wouldn't do it any other way. Because Baby Ishanvi will and always be a priority. But the truth also remains, that So-Saree will always be my first baby and something I am really passionate about. And so, So-Saree will continue on its journey. It might be slow, laid back and might have a few hiccups too. But, yes we will do it. Because it's so worth it. Like every year, I want to thank all my readers, followers and fellow blogger friends who have encouraged and inspired me always. I Am because You Are! To celebrate our 6th Blogoversary, we are announcing a giveaway. 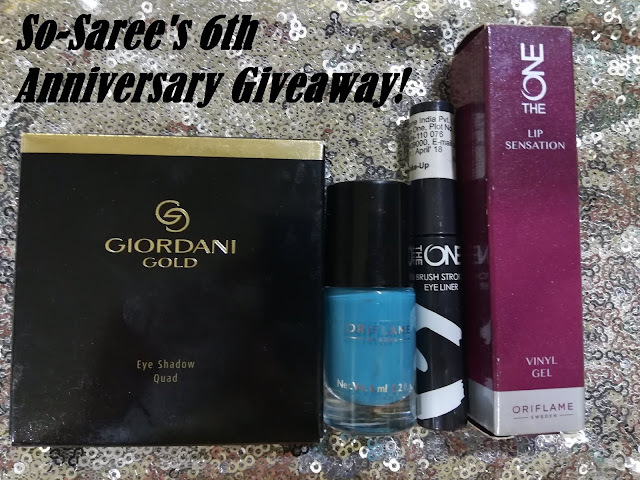 One lucky winner will win these 4 amazing products from Oriflame worth approximately Rs. 3000. One lucky winner will be picked from a pool of eligible entries by a lucky draw. Giveaway ends on the 12th of February 2019 and the winner will be announced shortly after that. Congratulations dear! I also would be completing 6 years in April. And I totally agree with our blog being our babies...my blog is my first born! Congratulations to my good friend Aditi on completing 6 years blogging really proud of u. May u continue to grow and prosper more and more. Congratulation On 6th Anniversary !! !